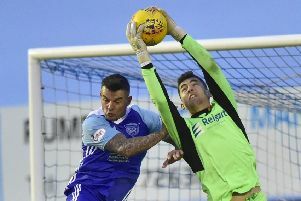 Peterhead boss Jim McInally says his players need to continue to work hard to stay top of League 2 after leapfrogging Edinburgh City on Saturday. The Blue Toon have lost just one of their opening 11 fixtures and their 2-1 win at home to Albion on Saturday, their ninth of the season, was enough to put them top of the table with Edinburgh City losing at Clyde. 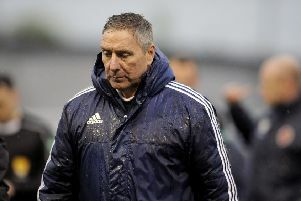 “If you think about the amount of games that the players have won, that was why I have been trying not to be too harsh on them in the dressing room,” said McInally. Derek Lyle bagged himself a brace within 16 minutes at a blustery Balmoor and his side were able to survive the conditions and a second half Albion goal to hold on to the win and the three points. “It was a game of two halves,” said McInally. Next up for Peterhead will be a trip to Hampden Park to take on sixth place Queens Park.